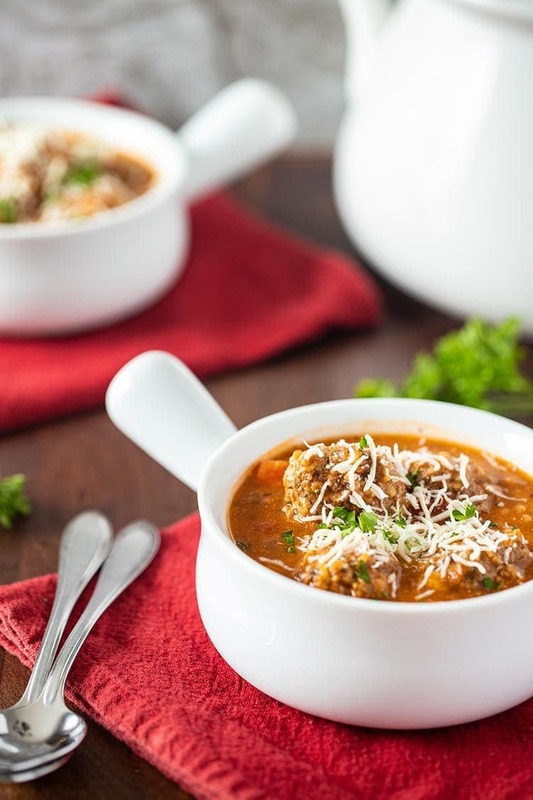 Perfect for spring, winter, or fall, this Instant Pot Hearty Meatball soup is sure to fill your belly and warm your soul! It takes just minutes to prepare as a freezer meal, and it can go straight from the freezer into your Instant Pot with no thawing necessary! I love finding great deals on ground beef and turning it into easy baked meatballs for my freezer! It is so handy to have frozen meatballs already cooked and on-hand for easy meals. They get used for a lot of spaghetti and meatballs, but as we’ve tried to stay away from too many carbs lately, I needed to find another good use for them. 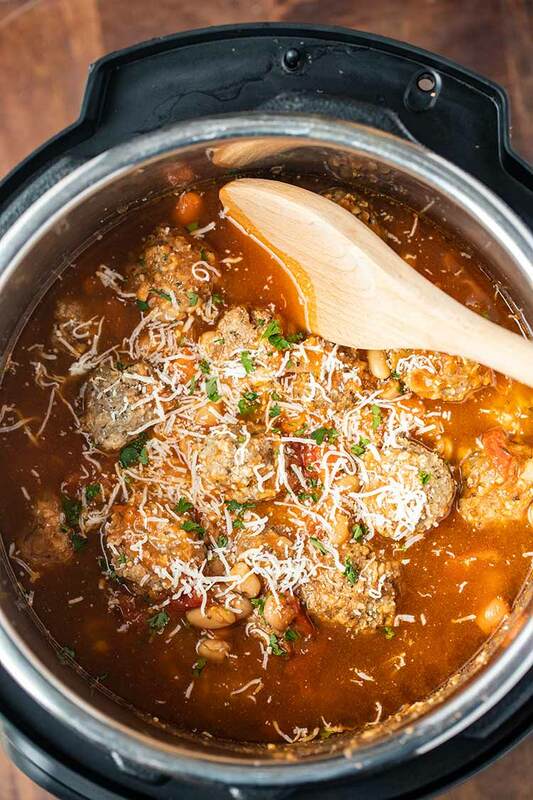 Enter this fabulous Instant Pot Hearty Meatball Soup! It is an easy dump-style freezer meal that you can put together in just a few minutes. The addition of cannellini beans gives this flavorful Instant Pot soup a bit more staying power, keeping you full for longer. Plus, they’re a healthy way to add in some extra protein and lots of good fiber. There aren’t really a lot of special instructions for putting this meal together – it really is just to literally put all of the ingredients into your freezer container and then label, date, and freeze. However, I’m going to give you two options for freezing this wonderful meatball soup – you can use either, or make a couple of both, depending on what best fits your needs. For this method, you will place all of our ingredients in the freezer bag except for the beef broth. This will allow you to get all the ingredients in one bag, and help avoid overfilling the bag, which can tend to lead to leaks. It will also allow you to store the frozen bags a little better in your freezer and not take up as much room as other options. Then lay your bags flattened out on a cookie sheet or tray and stick in the freezer. Once frozen, you can remove the bags from the tray, and stack them in the freezer to take up less space. You can even stack them on end like you would books on a bookshelf. 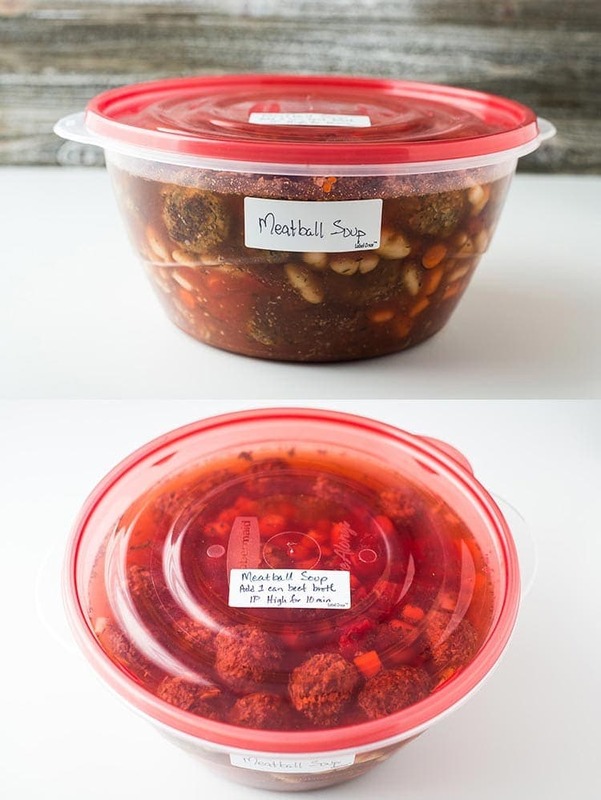 This is a great way to save space in the your freezer. But the only caveat is that you will need to make sure you have the beef broth on hand when you go to make this. AND you will need to thaw this meal at least partially before putting it in the Instant Pot or pressure cooker to cook, because otherwise it won’t fit. For this method, you will need to find a plastic food storage container that closely matches the interior dimensions of the cooking pot for your pressure cooker. I have found that these 64oz deli containers work nicely. I have the set of 10 and they have held up great in the freezer so far. You can also find similar sized containers used for jello salads and potato salads at grocery stores, so if you buy those items, don’t throw out your containers! Or some smaller ice cream buckets are about the right size. You will need to omit some or all of the beef broth in order to get everything to fit into the freezer container. Add in what you can, 1 can at a time, but be sure to leave at least 1 can of broth out. I use Rubbermaid Takealongs Large Round Containers, the 15.7 cup size. I have found them at my local Walmart, but they can be hit or miss as to whether they are in stock. But they are the perfect size to work with my 8 quart Instant Pot. You should be able to fit all the ingredients into one container – except that you will purposely leave out on can of broth to be added at the time of cooking. 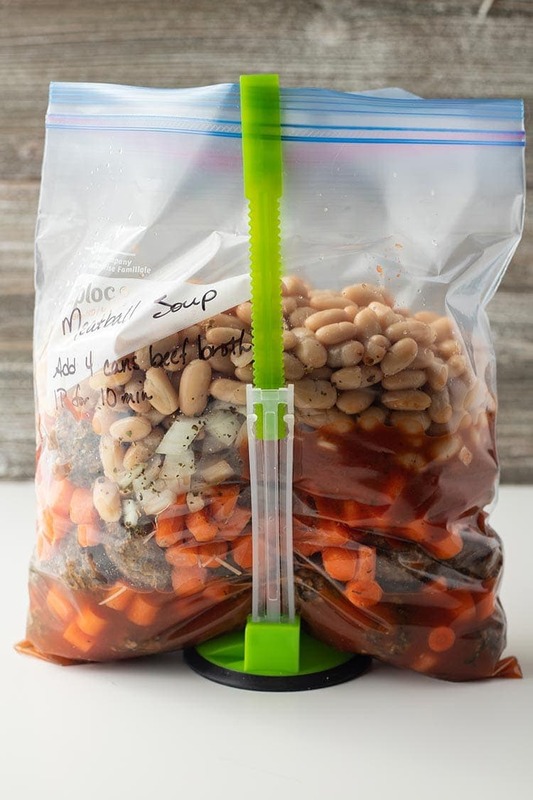 Be sure to label your container with the contents, date, and the cooking instructions AND include however much broth you need to add at time of cooking (based on which container you use and how much it can hold). I’ve heard people swear by using china or grease pencils to write on plastic containers. I did not have a great experience – I found them difficult to write with, and then I couldn’t get the grease pencil to wash off the container very well! You might have better luck than me, so this is totally a doable option. These are the ones I have tried. When I was making a bunch of individually portioned freezer meals for my mom, I found these stick-on freezer labels and pens, and they have worked wonderfully! They have held up well through multiple washings, even in the dishwasher, and the pen comes right off with the included eraser. They aren’t cheap, but if you do a lot of freezer meals in plastic containers, these are a great option since they are reusable. Now, why leave the can of broth out, you ask? Because, this will allow you to turn these into meals that can go straight from the freezer right into your Instant Pot! No thawing necessary! Remove your container with the frozen soup ingredients from the freezer. Run the outside of the container under warm water for about a minute, and then you should be able to pop out your giant soup “cube”. Place the frozen contents into your Instant Pot or pressure cooker. Add in the remaining broth, and set your pot to cook as instructed. That’s it! You generally should not have to add any additional cook time, even going straight from frozen, but it will increase the time it takes your cooker to come to pressure, so just be aware and plan accordingly. 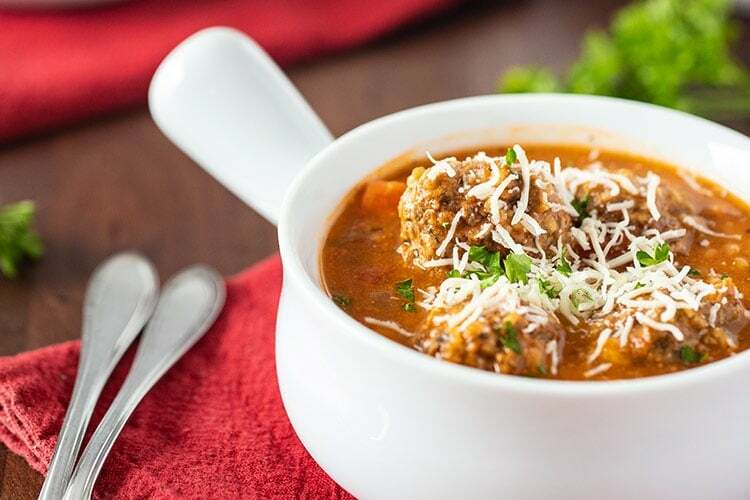 This Hearty Meatball Soup for the Instant Pot has been a big hit around our house, and I hope it will become a favorite at your house, too! If you make this, I’d love for you to leave a comment and let me know what you think! Or snap a pic and tag me on Facebook or Instagram! And as always, be sure to pin this recipe to your Pinterest boards so you’ll know where to find it!! Place all ingredients except beef broth and cheese into your freezer bag. Label, date, and place container in freezer to freeze. Be sure to include instructions for adding broth and cook time. Remove freezer bag from freeze and place into refrigerator to thaw overnight. Empty contents of bag into Instant Pot and add in four cans of beef broth (or two cartons). Close and lock lid, and turn venting knob to the sealing position. Press Manual/PressureCook (depending on your model) on your Instant Pot, and adjust the time to 10 minutes. Make sure it is set to HIGH pressure. When cook time is up and your Instant Pot beeps, quick release the pressure by carefully turning the vent knob to vent. Serve, garnished with shredded cheese (if desired). Place all ingredients except beef broth and cheese into your container. Add broth in one can at a time, up to three cans, depending on the size and capacity of your container. Be sure to leave AT LEAST 1 can of the beef broth OUT. Remove container from freezer. Run the outside of the container under warm water for about a minute to loosen the contents inside. Remove the frozen soup "cube" and place in your Instant Pot. Add broth (however many cans did not fit into your container at time of freezing, no less than 1 can at least). Close and lock lid and set venting knob to the sealing position. Press Manual/PressureCook (depending on your model) on your Instant Pot, and adjust the time to 10 minutes. Make sure it is set to HIGH pressure. Some of the broth will be withheld when you make the freezer meal and will only be added at time of cooking. The amount you include or withhold will depend on which freezer method you choose to use.